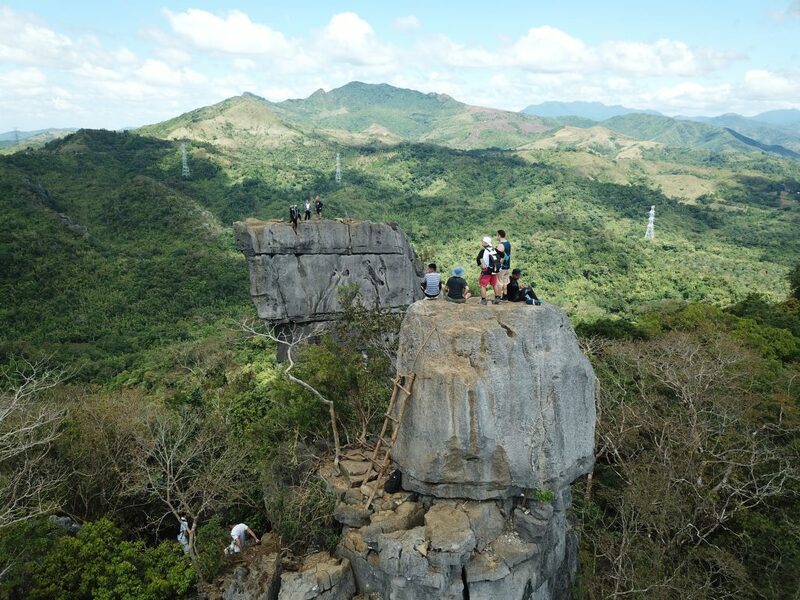 Nagpatong Rock is located in Tanay, Rizal, around two hours from Manila. Tanay is a great little place and is home to some of my favourite places in the Philippines like Batlag Falls and Calinawan Cave. As far as Nagpatong Rock is concerned, I stumbled across this place doing some research for day trips from Manila. I came across some photos of Nagpatong Rock and was immediately captivated. This is a very unusual and unique looking rock formation. It basically looks like a sculptured giant rectangular block standing on its end. At first glance, I wasn’t sure how difficult it would be to get to the top of his rock. It looked like it was a fair challenge to reach the top of the rock. However, I figured that it must be fairly easy due to the numerous photos of people posing on top of the rock. After some further reading and probing, I thought it would be worth testing myself on this hike. After all, I didn’t want to miss out getting my photo taken on top of the rock like everyone else! It really did look amazing but seemed like it would be a pretty tough hike. When driving along the Marcos Highway through Marakina and then further on to Baras, you really need to keep your eyes open. There is NO signage at all for the turn-off. There is a very good chance you will drive straight past the turn off point. We had to stop and ask for directions on a few occasions as we got near the registration area. Even Waze and Google Maps weren’t 100% accurate. I have included more information about directions at the bottom of this page. The registration area is somewhat confusing as it isn’t actually near the starting point of the hike. The locals there are very helpful so just ask around and they will assist you in registering (including guides) and then getting started on your hike. The hike starts off fairly easy but after about an hour it gets quite difficult. After about 1km you reach the first stop which was a little hut selling various drinks and snacks. From then on the track becomes very rocky. There are some parts where you almost needed to crawl on your hands and knees up the rocks to get to the next level. It wasn’t very vigorous but you really had to be careful where you placed your face on each step. 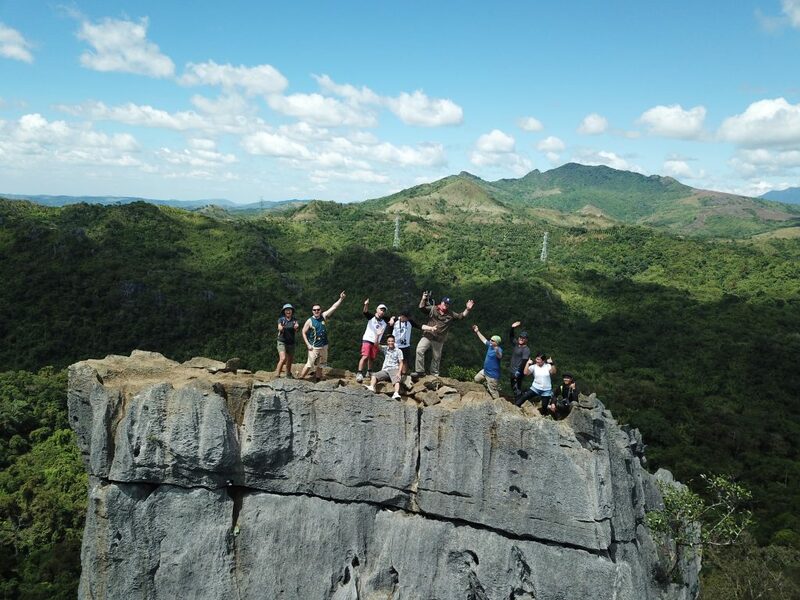 The next stop was at a base camp at the foothills of the actual rock formations that housed Nagpatong Rock. There were a number of huts scattered along the trail in which you could eat your lunch. There are a few snacks available but I would certainly recommend bringing your own picnic style lunch. Depending what time you start the hike, you can have your lunch here on the way back down from Nagpatong Rock. From here on the rocks change from boulders to limestone karsts and are quite jagged and pointy. This makes it difficult to get your footing and also for your hands when it comes to holding on for balance. After about two hours, you reach the base of Nagpatong Rock. There you will find a fairly clandestine bamboo ladder which is used to scale the near vertical rock face to reach the top. You will also find a crowd of people as they only allow about three groups of people up the rock at a time. The reason for this is that the top of the rock can only accommodate approximately 20 people at a time, safely. If you’re feeling brave, while you’re waiting, there is another rock formation nearby. If you are brave enough to scale this, there is actually a nice front on view of Nagpatong Rock. This is actually the location where people get their photo taken from as they stand on top of Nagpatong Rock. I wouldn’t really recommend this section unless you were fairly fit and able. It is recommended to reserve some energy and adrenaline for the climb up Nagpatong Rock, which is the main spectacle. For the climb up to the top of Nagpatong Rock, you need to climb about 30 m more or less straight up the vertical face of the rock. There are some ropes to hold onto as well as the actual bamboo ladders, but it was truly a gravity-defying experience. To add to the nerves was the fact that it was no other safety equipment. It is a pretty scary experience. When you finally get to the top, you will see what all the hype was about. This truly is a remarkable experience with some amazing views. Luckily we had a drone and shot some amazing footage which you can see by watching my vlog. Going back down the ladder was almost harder than going up the ladder. You really need to make sure you have your footing is stable every step of the way down the ladder, and take your time. From there its back to the starting point. You can stop for lunch at the base camp if you want to rest, or you can soldier on all the way back. The hike back is about the same as the hike there, about two hours. 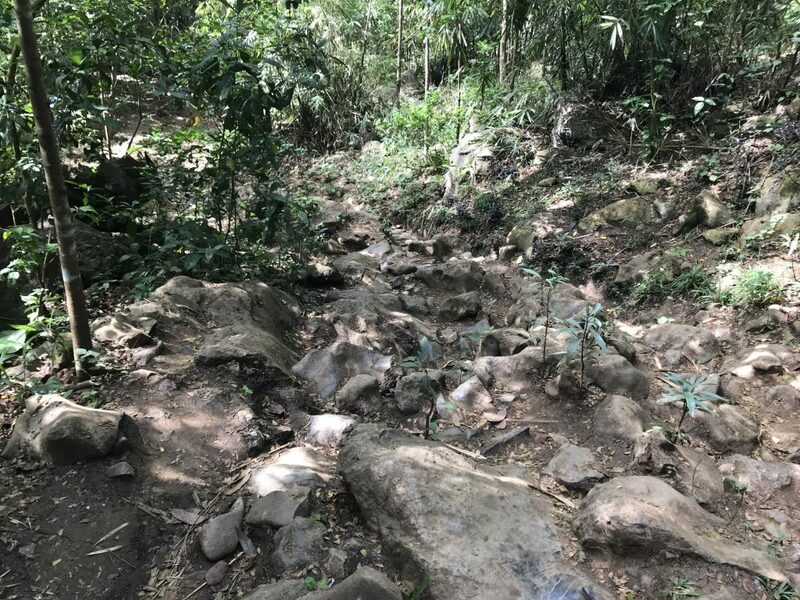 Be warned – the last part of the hike, on the good part of the trail, is a lot steeper than you think! Be prepared! Fees: P30 environmental fee per person, and P100 per person for registration. Then it’s P500 for a guide (one guide per 5 people). So basically it’s about P230 per person in total if you’re in a group of 5 or more. The trail starts off like any other dirt trail but you can see that its get very rocky at around the halfway point. You really need to watch your footing. Here is a drone shot overlooking the neighbouring Masungi Georeserve. You can see all the limestone karsts scattered around look like something from Palawan without the lagoons and ocean. This is the view from the drone of us on top of the “lookout rock” in the foreground. Nagpatong Rock is in the background. You can see there isn’t much margin for error up there! We made it to the top of Nagpatong Rock! It was like the scene from Rocky when he gets to the top of the stairs and pumps his fists triumphantly into the air. Check out my vlog about this epic place – please click below! When driving there, this place is easy to miss if you aren’t on the ball. 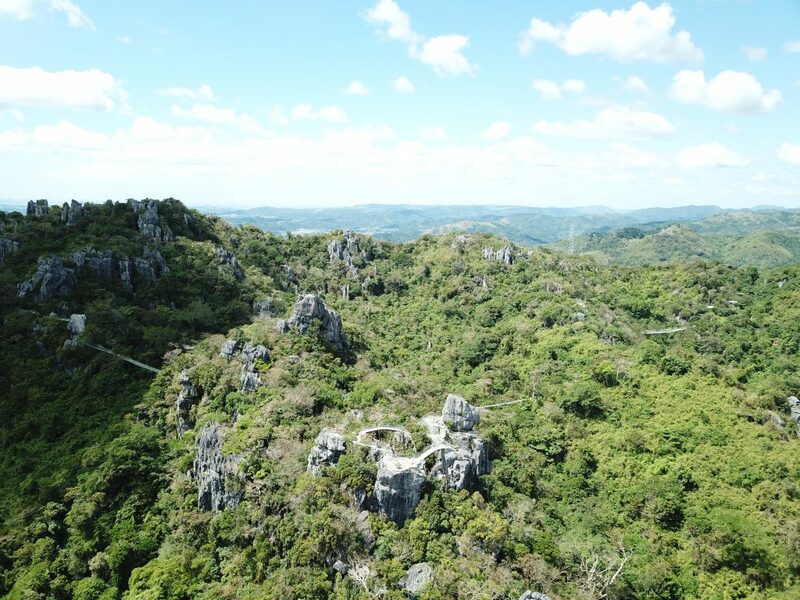 The landmark to look for via Waze or Google is Masungi Georeserve on Marcos (Marilaque) Highway. From there you need to look for Ynares Multi-Purpose Building in Cayumbay, Tanay, Rizal. You won’t see this from the highway. The turnoff for this is about 12 kms past Masungi Georeserve (on the same road – Marcos Highway). That is about a 20mins drive. The locals will help you out if you get into any trouble. From Makati, there are no buses running directly to Nagpatong Rock (Cayumbay). However, jeepneys do run from Makati to Antipolo or Cubao. From Antipolo or Cubao, there are jeepneys available that are bound for Tanay in Rizal, just jump off at Cayumbay. From Makati, this would probably take 2.5 hours and cost no more than P100. I also read that you need to take a tricycle to the barangay hall in Cayumbay to register. Either way, the locals can help out. For those planning to visit Nagpatong Rock, I would seriously make sure that you are well prepared. This is right up there in probably the top 3 hardest hikes I have been on in this country. It really isn’t for the faint-hearted. You should be relatively fit and healthy. I wouldn’t recommend this for kids below 15 years old and anyone over the age of 50 should really think twice depending on their physical condition.